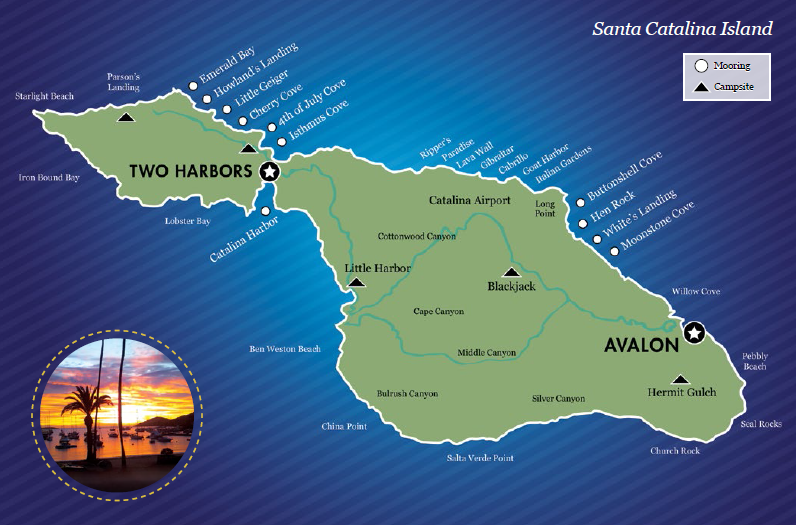 The moorings around Santa Catalina Island are leased to private parties but rented when available. Mooring charges are based on the size of the mooring and the length of your stay. Rented moorings are available on a first-come, first-serve basis. When you arrive, call the Harbor Patrol on VHF Channel 09 and name the cove you wish to moor. View of Map of the Two Harbors Mooring Sites. Mooring lessees call or email the Harbor Department for their reservations. Please call 310.510.4253 for mooring information. Check-out time is 8:00 AM. If you wish to extend your stay, please contact the Harbor Patrol via VHF Channel 09 to check availability. Boaters may apply to the Wait List to become a Mooring Site Sublessee. There are 11 coves that can be applied for. Each cove listing has a $25.00 start-up fee with an annual maintenance fee of $10 per cove listing. The average to time to obtain a Mooring Site Sublease and Service Contract is between 10 to 32, years depending on the cove. Individuals with a sublease agreement may assign their mooring to boats that fall within the size configuration of that mooring. Unreserved moorings are assigned on a first-come, first-serve basis. Sub-lessees must reserve within 24 hours in advance of their arrival time for weekdays, and by Thursday evening at 8:00 PM for weekend use.